Today ends my last week of full-on training before my taper starts next week in preparation for the Kent Coastal marathon on September 4th...and I'm very pleased with how it's gone. I've run 40 miles which is the highest mileage in a week I've ever managed, and although I'm definitely feeling the distance in my legs, most importantly I haven't (so far, touch wood!) picked up any injuries. Below is my graph from my dailymile.com account, showing my running over the last 20 weeks - you can see I've not had the most perfect training, but bearing in mind I did my other two marathons this year in weeks 16 and 19 (this week is 33) I don't think it's been too bad. My total mileage so far this year is 830 which isn't quite where I wanted to be by middle of August, but it's still a number I'm proud of. I went out for this week's long run yesterday - 21 miles - which is the furthest distance I've run on this round of training. I ended up picking a pretty uninspiring out and back route - it was all pavement along main roads between and then through various local villages but there were quite a few hills. 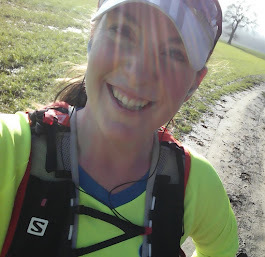 In the past, I've picked very flat routes along canals for my 20-odd mile runs, but decided that this time, that would be copping out - I wanted to really see how I'd cope along a more normal route at that distance, especially bearing in mind that my forthcoming marathon is pretty undulating. Although I'm sure the ice helped, needless to say this morning I was definitely feeling the aches in my legs. I knew I needed to get out for another 6 miles today but wasn't looking forward to it! I took it very slowly until my legs had loosened up a bit, and really didn't push myself at all, and after a couple of miles, I felt pretty comfortable. Although I could tell from every aspect of my run I was tired after yesterday, I got out & I did it. Unfortunately though, for the first time with this pair, I also felt my trainers rubbing a bit on the tops of my toes - I'm not quite sure why, but it does mean I'm going to have to make a decision about whether I need to buy some new ones. If I do want to, I'll have to buy them in the next couple of days so I still get enough miles in them before the marathon to make sure they'll be comfy! Anyway, I'm very proud of my total of 40 miles! So, now, to rest and recover, enjoy the taper (35 miles next week, the one after 25 miles), and then get ready for the marathon the week after that! Can I be a Billericay Strider too?